But think about it; even if you don't plan on making any meals for yourself (something I actually enjoy when on vacation), you'll still probably need to stop in at one of the Virgin Islands groceries or markets for snack items, bottled water, toiletries, batteries, and so forth. Food prices are high, since everything is shipped in; you may experience "sticker shock" the first time you go into one of the Virgin Islands groceries! So read on; this is where you'll find tips on the various groceries in the islands. Pueblo is a grocery-store chain that has several locations on both St Thomas and St Croix. It's a good, basic grocery store, with a decent selection of items. 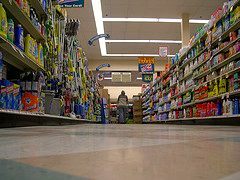 It's comparable to a smaller neighborhood-type grocery store in the U.S., with a basic selection of staple foods and other items. Food Center is on the east end, right on the way to Red Hook from Charlotte Amalie on Rt. 32 (a mile or two west of Red Hook). A nice store, pretty well stocked, with good, helpful staff and a good selection of foods. Marina Market is right in the heart of Red Hook, and, although it's not very big, it has a surprisingly good selection of items, including a good number of gourmet-type foods like you might find in a gourmet market in the U.S. They also have an excellent bakery section with high-quality fresh-baked cakes, cookies, pies, etc. Groceries on St John tend to be pricier than on St Thomas or St Croix, since everything has to be brought in by ferry from St Thomas. Because of this price difference, some people stock up in St Thomas ahead of time for their stay on St John. It's really up to you; it probably doesn't make sense to make a special trip to St Thomas for groceries, unless you're buying a huge amount of stuff; the money you'll spend on ferry and taxi will probably cancel out any savings you'd get on the groceries. On the other hand, if you're on your way to St John and you'll be doing all your own cooking, stocking up on St Thomas before taking the ferry over might make sense. Dolphin Market is in Cruz Bay, across from Texaco. It's the smaller of the two groceries in town. Their items, however, tend to be high quality, with a leaning toward gourmet-type and natural foods. They also have a good wine selection, a deli, and a pretty good selection of over-the-counter medications. Starfish Market is the larger grocery in Cruz Bay. It's pretty comparable to a modest U.S. grocery store, with produce, meat, seafood, and dairy sections, as well as baked goods (fresh and packaged), a deli area, and a large beer, wine, and liquor selection. Some gourmet and natural foods, too. Located in the Marketplace Complex. Pueblo: Like St Thomas, St Croix has Pueblo stores. See the description above for St Thomas. Plaza Extra: This isn't just the best of all Virgin Islands groceries; it's probably one of the best groceries anywhere! Large, amazingly well stocked; I counted seventeen kinds of bacon, eight different kinds of butter, a huge array of breads and baked goods, big produce department, and on and on! Two locations, one just east of Frederiksted on the north side of Centerline Road and the other near the middle of the island on Rt.70. So, that's my list of recommended Virgin Islands Groceries. I hope it helps you while you're visiting!